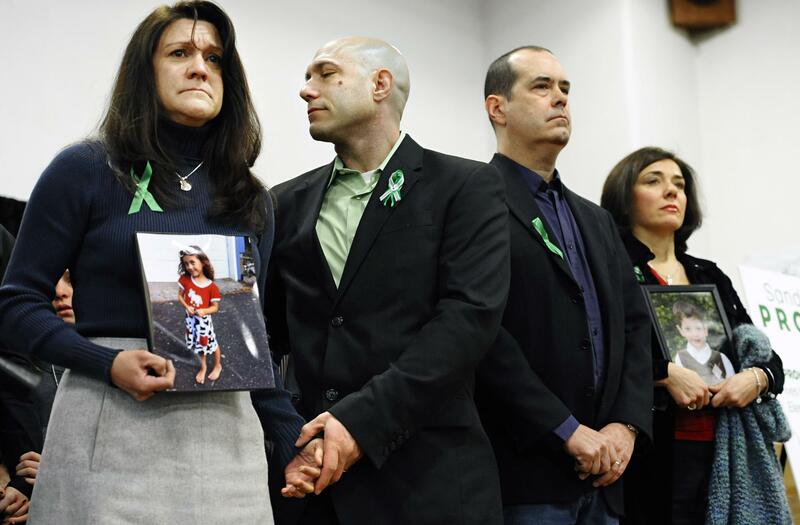 Jennifer Hensel (left) and Jeremy Richman (center left), parents of Sandy Hook shooting victim Avielle Rose Richman, at a news conference at Edmond Town Hall in Newtown, Conn., a month after the shooting. In rooms well stocked with paint and brushes, toys and musical instruments, young survivors of the Sandy Hook school shooting still engage in art and play and music therapy. And staff members at the center say they are still welcoming new clients, people showing up for the first time to ask for help. In Newtown — maybe more than anyplace else in the country — the persistence of traumatic grief is widely recognized, a reality woven into the fabric of everyday life. That reality engulfed the town again last week, with the devastating news that Dr. Jeremy Richman had died by suicide. Richman, 49, was a neuroscientist and activist, well known and much loved here. After his 6-year-old daughter, Avielle, was shot and killed at Sandy Hook Elementary School in 2012, with 19 other first-graders and six educators, he became a crusader for brain research, honoring the memory of his child with a quest to find the causes of violent behavior. “He would always say, ‘We know more about the ocean floor and outer space than we do about the brain,’ and he was trying to change that,” said Sokira. 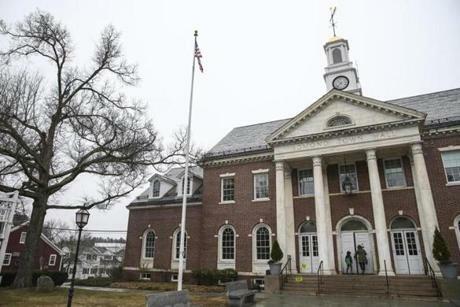 Edmond Town Hall in the center of Newtown, Conn. Jeremy Richman, the father of a Sandy Hook shooting victim, had an office in the building. For the other Newtown parents who knew his suffering and his strength, as they struggled together through the violent loss of their children, Richman’s death was an excruciating blow. Into the chasm of the loss, fear rose: Who else, they worried, might be losing hope? “I felt like the rug had been pulled out from under me,” said Scarlett Lewis, a Newtown parent who, like Richman, started a foundation to work toward violence prevention after her son Jesse, 6, was killed at Sandy Hook. Richman’s death on March 25 closely followed two suicides last month, in Florida, of students who survived the 2018 mass shooting at Marjory Stoneman Douglas High School. Sydney Aiello, 19, who took her own life on March 17, had been diagnosed with PTSD and suffered from survivor’s guilt, according to her mother. The other student, a minor, has not been identified. Mental health experts said more research is needed to understand the links between trauma and suicide. But they stressed the need to keep checking in on people. In a statement last week, Richman’s widow, Jennifer Hensel, called her husband her champion, “the love of my life” — and “the person who had every tool in the toolbox at his disposal,” an acknowledgment of his expertise in mental health. “He succumbed to the grief that he could not escape,” she wrote. Just three weeks before he died, Richman hosted a talk in Newtown by the social work researcher Brené Brown, one of a series of events he organized to promote brain health and ease the stigma of mental illness. Lewis, who attended the talk, said Brown stressed the need for the community to keep engaging with the pain of the victims’ families. In some ways, grief support has become a part of the infrastructure. 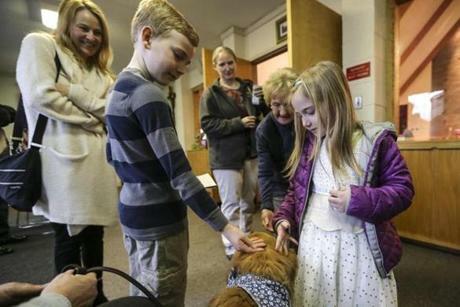 The local comfort dog, a silky, copper-colored golden retriever named Maggie, still visits schools to connect with children affected by the shooting, and the comfortable couches at the Resiliency Center remain a vital hub for families linked by loss. After Richman’s suicide, the town responded quickly, a reflection of its unwanted expertise. 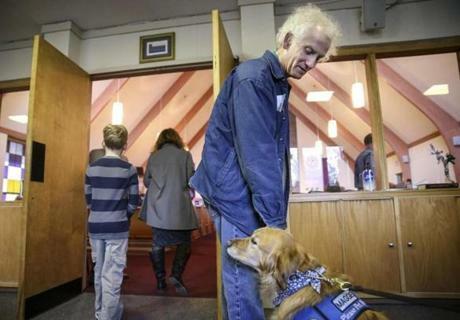 Gordon Thompson pets Maggie, a 7-year-old golden retriever comfort dog, before a Sunday service at Christ the King Lutheran Church in Newtown, Conn. The Resiliency Center offered counseling or less formal conversation, accompanied by hot tea and banana bread. Others in town also tried to offer solace. In the picturesque town center at the top of Church Hill Road, clergy at Trinity Episcopal Church unlocked the bright red door of their stone church and set out an “Open for Prayer” sign. Across the street at the public library, someone left a stack of freshly printed papers near the entrance, a list compiled by town officials of mental health resources for people in distress. Following his daughter’s death, Richman had spoken candidly about his own grief, in the hope that it might inspire change. He and his wife were left childless by Avielle’s death in 2012, and his anguish endured even as they later welcomed two more children. In 2017, he described to an NPR reporter the pain of losing memories as time went by — like the sound of his daughter’s voice — and of trying to explain to her two young siblings why she wasn’t there to grow up beside them. Some youngsters greeted Maggie at Christ the King Lutheran Church. Within days of the mass shooting, he and his wife started work on the Avielle Foundation, named for their curly-haired first child, to promote research into what causes violence. He left his job at a pharmaceutical company to devote himself to the cause, raising money and speaking around the country. But he also threw himself into smaller community projects, making time to train 150 Newtown area residents to distinguish signs and symptoms of brain disease from healthy responses to pain. His work — and in the end, his death — underlined a growing disconnect: The age-adjusted suicide rate in the United States increased 33 percent from 1999 to 2017, according to the CDC, yet brain research remains sharply underfunded, according to experts. “There’s an ambivalence about it, a feeling that ‘If someone’s going to do it, they’re going to do it’,” said Dr. Jane Tillman, director of the Erikson Institute for Education and Research at the Austen Riggs Center in Stockbridge. In fact, experts said, the suicide impulse is fleeting. Loved ones can help by asking specific and open-ended questions about feelings and intentions, by expressing care and concern, and, most importantly, by listening. That outreach is essential, but it is also hard, acknowledged Lewis, who recalled how reluctant people were, after the shooting, to talk with her older son about the loss of his brother. “It takes courage to be with someone who’s grieving, to sit in the discomfort of that,” she said. Hard, too, is figuring out how to balance ongoing trauma support with the risk that the support itself could trigger anxiety. When volunteers bring Maggie, the comfort dog, to visit schools — as they did again after Richman’s death — students sometimes ask if something bad has happened. Maggie sat inside the sanctuary of Christ the King Lutheran Church. 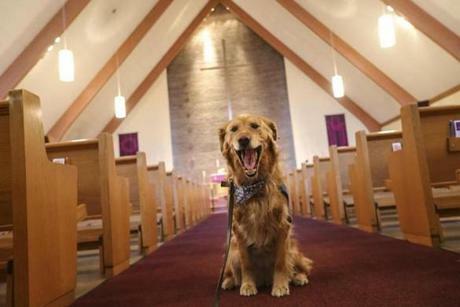 The sweet-natured dog now frequents Newtown Middle School, where the children who survived the shooting as first-graders are now in seventh grade. Some worry key supports could disappear, leaving a dangerous void. At the Resiliency Center, staff said government funding has declined with the passage of time — even as they host delegations from a growing number of communities traumatized by more recent mass shootings, who seek to model their own recovery efforts on Newtown’s. 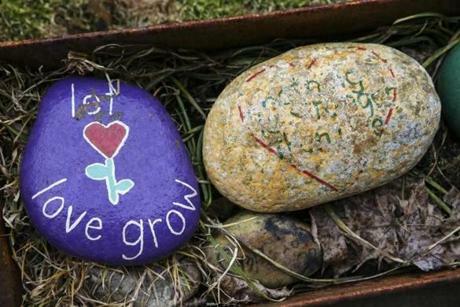 "Let love grow" is painted on a rock outside the front door of the Resiliency Center of Newtown. The town is also grappling with a widening divide, several residents said, between people who lived there when the unimaginable happened and people who moved there afterward. The population of 27,000 still includes many who remember the old Sandy Hook elementary school, demolished after the shooting — and others who know only the new school built in its place, its undulating, gently weathered wood facade set back behind a heavy metal security gate. 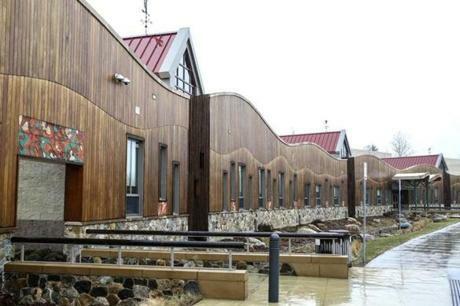 The front of the new Sandy Hook Elementary School in Newtown, Conn. The gap between the two groups can be hard to bridge. Cortney Troccolla, a young Newtown native working at a dry cleaner downtown, said she still struggles with the questions and misunderstandings of outsiders. “That was my school,” she said, her eyes filling with tears. 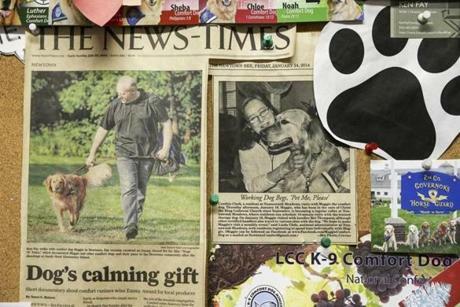 News clips were pinned to a bulletin board inside the Christ the King Lutheran Church. Crisis Text Line is free, 24/7 support for those in crisis. Text 741741 from anywhere in the United States to text with a trained crisis counselor. Follow her on Twitter @jrussglobe.